Teleseminar & Self-Study Coaching Program: The Law of Attraction Cafe - How to Get What You Desire in All Areas of Your Life from Ready2Go Marketing Solutions, Inc. So, what do you want in your life? Is it a relationship? Maybe a new car? Perhaps the perfect job? Well, whatever you want, the Law of Attraction is there to help you get it. The Law of Attraction is an interesting phenomenon of the universe that states that you will attract into your life whatever you think about most - that your most dominant thoughts will manifest themselves into your reality. This law is always working to give people the very things they most desire. Now, that might sound a little crazy, but it actually makes perfect sense. The universe is just responding to the vibration you are putting out at every moment and giving you more of the same. But here's the kicker. It doesn't differentiate between positive or negative, and therefore it gives you what you think about regardless of its positive or negative nature. It may at first be hard to accept that anything you want to create is possible, and that all it will take on your part is desire and belief that it will definitely be so. But that's exactly what thousands of people have already experienced by implementing the Law of Attraction's simple three-step process. In this teleseminar, you will examine how the Law of Attraction works and with a desire of your choosing, you will practice the Law of Attraction's powerful manifestation method. This program will help your participants evaluate what is showing up in their lives, set a clear intention for what they want, and implement a simple, practical, powerful Law of Attraction process that will draw to themselves whatever they desire. How to start getting stronger results in their life by using one of the most powerful tools known to man (just a few simple instructions and it's theirs to use too). Step by step guidance to harness the power of the Law of Attraction - even if they are new or skeptical. 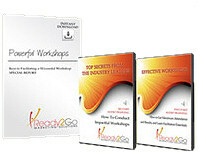 The 7 critical elements needed to get the most from the Law of Attraction process. The dangerous "toxins" that are keeping your participants from love, prosperity and good health, and that must be eliminated! Introduction -"The Law of Attraction Cafe Dining Experience"
Activity Objective: Participants recognize the connection between their thoughts and what manifests in their lives. Activity Objective: Participants explore the first steps of the Law of Attraction process - declaring their intentions. Activity Objective: Participants recognize the importance of getting clear about what they want to attract into their lives. Activity Objective: Participants identify where the Law of Attraction is working in their lives to help counter any doubt they have about the process. Activity Objective: Participants realize the role emotions play in manifesting their desires, and practice a simple technique to maintain a positive emotional state. Activity Objective: Participants realize the importance of continually living at a high vibrational state. Activity Objective: Participants take time to appreciate the good things in their lives so they can maintain a positive vibrational energy. Activity Objective: Participants reflect back on the Law of Attraction process they have experienced and identify what was most valuable for them.